REVERE Award Finalist, PreK-12 Learning Group, Association of American Publishers! If you’re charged with helping educators achieve the vision of the new science standards, this is the professional development resource you need. This book is chock-full of activities and useful advice for guiding teachers and administrators as they put the standards into practice in the classroom. Given the widespread changes in today’s education landscape, teachers and administrators may feel overwhelmed by the prospect of putting the new standards into practice. If you’re a science specialist, curriculum coordinator, or instructional coach who provides professional development, you will find this collection immensely helpful for heading off “initiative fatigue,” whether in an individual school or throughout a district. This has been my most widely used go-to book in my work as a science consultant. I work with teachers in grades preK-12. This book provides a quick intro and some basics on developing PD, then it breaks things down into different activities. 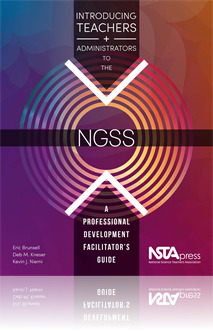 There are 24 activities, from looking through the layout of the NGSS to breaking down the 3 dimensions for participants to working to develop a unit applicable for the content they teach. Each activity is presented in the same format, background info is provided when needed. You can pick and choose which activities to include in your work. It's great for something quick at a staff meeting, or for a two day (or more) session.